Newcastle-upon-Tyne is a major city located in the north east of England, a previous industrial powerhouse, which has re-invented itself since the closing of its shipyards, to become a modern and lively urban centre of culture, with a new reputation! Today Newcastle's economy consists of business headquarters, learning organisations, digital technology, shopping and tourism, with super-stylish art and cultural centres! Newcastle is a vibrant, student-friendly and elegant city with a unique character and perhaps the friendliest people in all of England! Geordies, as the locals are called, are proud, hard-working and positive people who will welcome you to learn English in their wonderful, eclectic city. 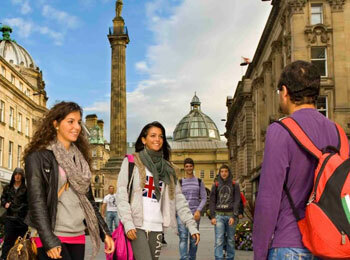 Newcastle is a fantastic location in England for international students. Our English language school, located in the heart of Newcastle, offers a very high standard of teaching and a wide range of programmes to suit students of all English levels and all requirements. The school is situated in a building of historic beauty and has 17 classrooms, a large language learning and computer suite with multimedia facilities, a large common room and cafe, serving hot and cold drinks, snacks and light meals throughout the day, as well as a reception area on the first floor, where the staff are more than happy to help you with any query you may have during your stay. There is WiFi internet access throughout the school. There is a large selection of courses to choose from at our school in Newcastle, with groups of just 12 students per class maximum. Many of the courses incorporate 1 hour each day of specialised personal study, which is offered uniquely at this school, giving students with different needs the chance to focus on a particular aspect of the language, whether you wish to further your listening skills, concentrate on exam preparation, on your pronunciation, or practise any other skills in greater detail. The Personal Study Programme (PSP) compliments your general English lessons, with a range of facilities, resources and guidance available. The general English courses available include the Semi-Intensive, Intensive and Super-Intensive programmes, meaning that you can choose between 15, 20 or 25 classes per week. These courses are often referred to as "English for Life" and are suitable for students of all levels of English. All language skills are covered in the classes, with tuition in reading, writing, speaking and listening, as well as vocabulary, grammar and pronunciation. There is a Business English course, consisting of 25 classes per week, designed to help students communicate successfully in any type of business situation. A B2 level of English is required to take this course, consisting of 10 hours of general English, 10 hours of specific Business English, plus 5 hours of personalised study each week. The teachers are well-trained, enthusiastic and highly-qualified, with several of them bringing many experiences from the world of business into the classrooms. The school offers Preparation courses for the IELTS examination, suitable for all students who are interested in further studies in a UK university, or higher education in another English-speaking country. You will receive 15 specialised lessons each week, including personalised study, focussed on academic English with exam practise. The teachers are specially trained to prepare students for the IELTS. You need a B1 level of English to take this course and this course can also be combined with 10 lessons of general English each week. The Cambridge English Exam Preparation Courses, are also available at our school in Newcastle for durations of 10 or 12 weeks, with 15 lessons per week, including 1 hour of personalised study each day. Again, you can add 10 lessons of general English classes to this course, if you are looking for a more intensive programme. All aspects of the Cambridge English exam strategy are covered, using a wide range of learning resources. Our school is an authorised Cambridge English examination centre, meaning that you can take the exam in the school building at the end of the course. Please contact us for details of specific start dates. If you are looking for real work experience in a company to compliment your English classes then you can choose the English with unpaid Work Experience programme in Newcastle! This option, consisting of 20 Business English classes per week for 8 weeks, plus an 8-week internship, will give you further practise and development of your language skills, as well as invaluable experience in a wide range of possible placements, including in event management, hospitality, import and export, theatre, marketing and many more! Students need to have a B2 English level and an EU passport to be able to take part in this programme. Of course, students who need a more flexible timetable, or who wish to maximize their progress in English, have the option to book a course of Private English Lessons. The best choice of accommodation for students who wish to practise their English outside of the classrooms, is to stay with one of our school´s carefully selected host families. The local people, known as Geordies, are well known internationally for their openness and friendliness and this is a great way to get an insight into daily life in England! You can book half-board accommodation with a British host family, which means that you will receive breakfast and the evening meal each day, with lunch included at the weekends, or you can even stay with an English-speaking host family on a self-catering basis and have access to the kitchen, where you can cook your own meals. All of the host families live around 20 minutes from the school by public transport. For more independence during your stay, as well as the chance to live with other international students, you can choose either a single or a shared room in a shared apartment, or in the university residence building, on a self-catering basis. The shared apartments are located just 5 minutes walking distance from the school. There are 3-6 bedrooms in each apartment with kitchen, lounge and shared bathroom. The apartments all have central heating, flat screen TVs and WiFi internet connection, as well as a 24-hour security system and on-site laundry facilities. 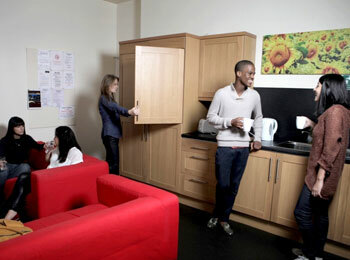 The university residence is also self-catering and located 15 minutes walking distance from the school. Each bedroom has a private bathroom and there is a shared kitchen and living area, as well as a 24 hour reception. All students have free internet access and there is satellite TV, as well as a telephone for incoming calls and on-site laundry facilities. Newcastle is a popular university city with a lot to offer international students! The school offers an exciting and varied activities programme each week, ensuring that you have the best possible time during your stay. Events include a welcome party, a tour of the city to visit some amazing places, such as the famous modern Sage Performance Arts Centre, the Millennium Bridge or the Baltic Art Gallery, perhaps combined with a few drinks in some of the city's nicest and most interesting pubs. There are sports nights and cinema nights, as well as evenings out to the theatre or to a concert. Weekend excursions will take you to stunning Edinburgh or to the beautiful city of York, as well as to world-famous castles in the surrounding area and there is also a regular 2-day excursion to London. You can dance the night away in Newcastle's clubs and bars, or you can relax and enjoy the quayside at sunset. There are hundreds of nice restaurants and possibilities for ice-skating, bowling or the more simple but enjoyable option of a traditional British pub night out. 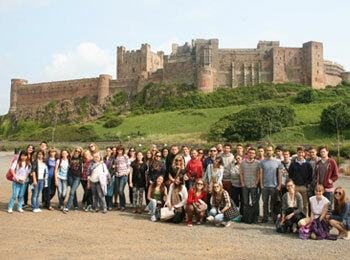 You are guaranteed to have a fantastic time during your English course and your stay in Newcastle! Transfers are available to all students from Newcastle International Airport, for an additional fee.